Tradition is as tradition does. 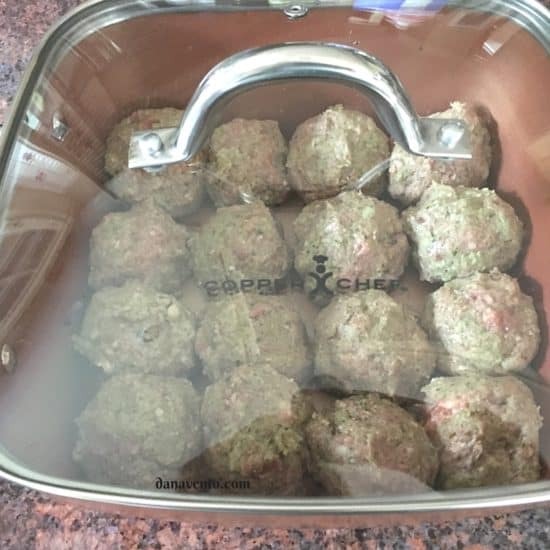 My mom, packs a mean meatball and today she tested out her recipe on some fabulous cookware. What she found out is that taking old recipes and merging them with new cookware totally innovates the process. The recipe my mom is sharing is one that I feasted on as a little girl, week after week. Now that I don’t eat meat, I know that it delicious as my kids love Gram’s meatballs so the tradition of creating delicious meatballs continues. 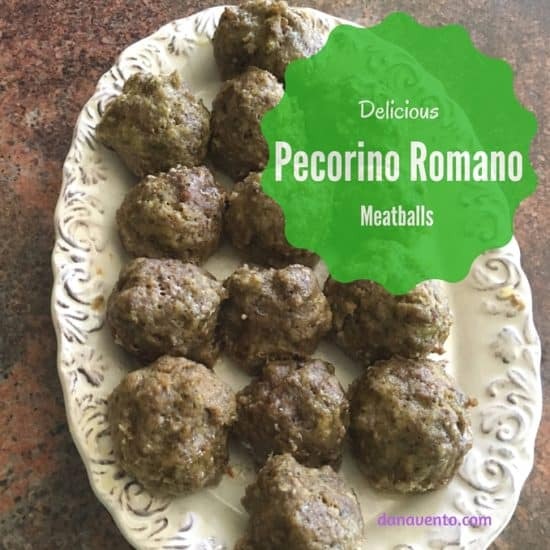 Pecorino Romano Meatballs is a very easy recipe to make, and the end result is a delicious blend of meat, and cheese creating a very bold taste, especially if placed upon fettuccine Alfredo. The recipe is all about keeping a blend easy, light and tasty. Lavishly live this recipe of Pecorino Romano Meatballs out loud and get that pasta ready! Meatballs are a timeless food, and they are versatile. The Pecorino Romano Meatballs my mom made actually can go on top of egg noodles, pasta and sauce, rice, mashed potatoes, grits and gravy and more. It’s nice to have a recipe that blends well with so many other side dishes. It was time to give my mom an upgrade, so when we were offered the opportunity to test out a piece of cookware that went from stove-top to oven and to table we said, “game on!” We have worked with a lot of pans, pots, and cookware, always the better brands and so far we have never been disappointed. 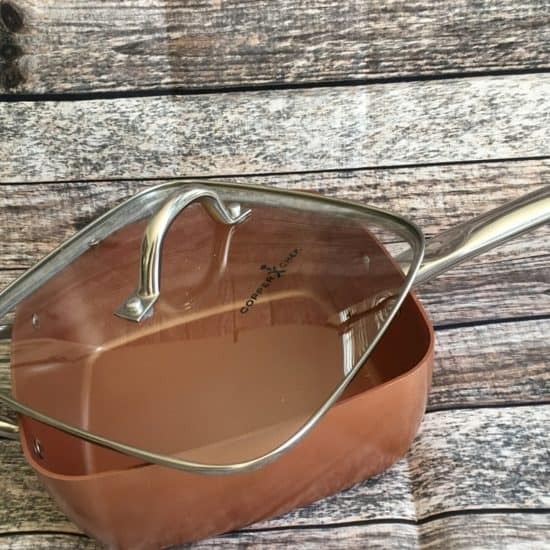 Copper Chef Cookware™ from TriStar Products is A fabulous multi-purpose kitchen tool, allowing the streamlining of multiple products into one pan. The shape is unique and it works on gas, electric, ceramic, and induction surfaces. The Copper Chef™ eliminated the need for multiple pots, pans and baking dishes and it functions as a roasting pan, rice cooker, steamer, stock pot, wok and baking dish – all in one! The pan is non-stick and offers a stainless steel induction plate. Yes it was non-stick and we used it upon a pro-gas stove. The cookware is nice and deep so if you choose to add sauce, you don’t have to worry about spill-over if you keep it reasonably filled. We found that you can bake, fry, boil, saute, steam and braise and you don’t have to add oils or butter. We did however, add non-stick spray just to be sure (so I just want to be clear and I do this with almost all my cookware ) The pan is 9 1/2″ square and boast a lid, a steam and roast rack as well as a fry basket. The clean up on the cookware was fabulous and meatballs are never fabulous to clean up. The pan is as it says, easy to clean up. The lid does get warm, I suggest using gloves and not touching it once it is heated or you will get burned. The versatility of being able to saute in it and then transfer it to the oven equates to one less pot to clean up and more time to enjoy. Always use a pot holder of sort to touch the handle, especially after the cookware comes out of the oven (hello, it is hot!) Now let’s get that recipe. Mix all together, form into golf ball size meatballs. Place in pan, saute quickly (2 minutes on medium heat) on stove-top to lightly brown, turn, place cover on and bake. Bake at 350° approximately 45 minutes. When Meatballs come out of the oven, sprinkle with an additional 1/4 C Pecorino Romano Cheese, they heat will allow the cheese to absorb into the meatballs and the flavor will be over-the-top fantastic. Serve alone, or atop your favorite pasta, or starch. Cover with sauce or let stand as is. Bake at 350° approximately 45 minutes. When meatballs come out of the oven, sprinkle with the additional 1/4 C Pecorino Romano Cheese, and allow this to seep, covered, it will bolster the flavor. Serve alone, or atop your favorite pasta, or starch. Cover with sauce or let stand as is. Pecorino Romano Meatballs are fast, fabulous and serve up perfect any day of the week or weekend. Make plenty so you are sure to have extras. Lavishly live food out loud and enjoy an easy to make Pecorino Romano Meatballs Recipe. I was craving for meatballs yesterday and you are my hero now. Thanks for the awesome recipe. Will do this later. I am looking to purchase meatballs for a recipe my daughter has requested. This recipe sounds really good! Not only do those meatballs look good, but that pan is amazing! I think I need to get one of those. 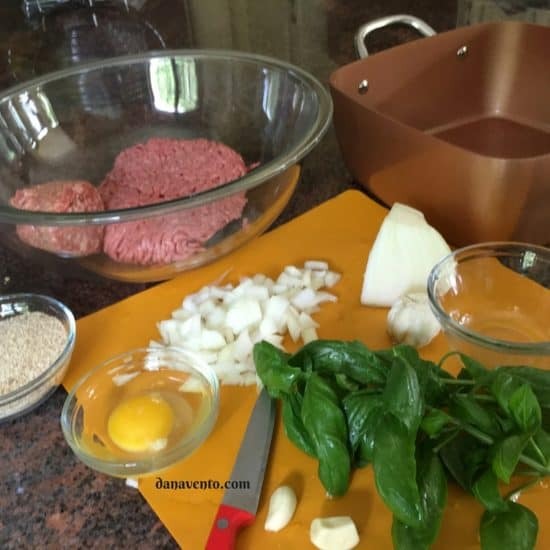 Those meatballs sound like they are really tasty…and that cookware is really eye-catching. I’ve never made my own meatballs before, but my Mom does. Yona Williams recently posted..How Do Pillsbury Moist Supreme Pink Lemonade Cupcakes Taste? Aww, that is absolutely super sweet of you to give your mom a new cookware. I am sure that he appreciates it. The feeling of having a new ‘toy’ in the kitchen makes preparing meals extra exciting, such as your Pecorino Romano Meatballs – I can already imagine pairing this with one of my favorite wines. What a perfect recipe, my two boys would love eating meatballs. These sound like really tasty meatballs. I am growing basil and I can’t wait for it to mature so I can cook with it. I’ll be sure to save your recipe to try at that time. my boys love my meatballs. This kind of dish is something new but i would want to try it. All for my boys. These meatballs looks lovely. I think meatballs taste so much better with cheese in them. Although I don’t really eat meat, it’s nice to have a recipe like this for parties, potlocks or when the kids are craving for something Italian! I really love how easy it is to make and it’s packed with flavor as well!